Approximately 58 to 66 million years ago (Paleocene epoch), a large body of water known as Lake Flagstaff covered parts of northeastern and central Utah. This lake deposited a sequence of sediments that formed rocks known as the Flagstaff Formation. 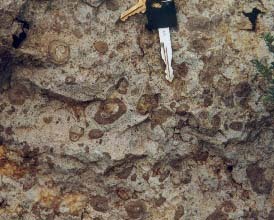 Although these rocks are technically a limestone, the building stone industry has termed this deposit a “marble.” The rocks are rich in algal ball structures commonly known as “birdseyes.” These birdseye features were formed by algae that grew around snail shells, twigs, or other debris. The algae used these objects as a nucleus, forming into unusual, elongated, concentric shapes. From Salt Lake City take I-15 south approximately 50 miles to Spanish Fork (exit 261). Travel east and proceed up Spanish Fork Canyon (Rte 6) for about 13.5 miles to Hwy 89. Make a right onto Hwy 89 and go south about 5.8 miles until you see a gravel road to your left. Make the left turn and proceed up the road until you reach a gate. This gate marks the beginning of Forest Service Road 126. Before you proceed up the road, remember to close the gate after yourself. Continue up this road for about 1.5 miles until you see a sign indicating that you have crossed into the Forest Service lands. 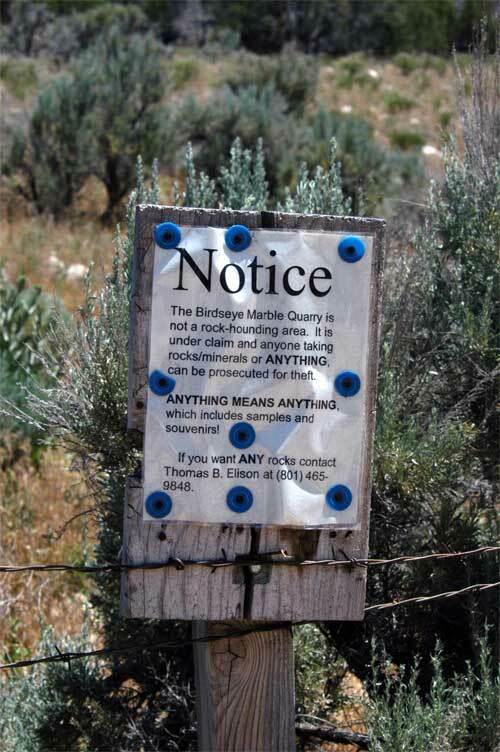 Specimens can be found along the road just after crossing the Forest Service boundary. If you feel adventurous, this road can be followed up to the abandoned birdseye marble quarry (roughly 2.5 miles), but four wheel drive is highly recommended. Some of the birdseye marble contains cores of snail fossils, which have been replaced by the mineral calcite. This material takes a great polish and is ideal for making unusual decorative bookends. Nephi 1:100,000-scale topographic map; Birdseye 1:24,000-scale topographic map; Manti-La Sal Forest Service map covering the Sanpete, Ferron, and Price ranger districts; and a Utah highway map. Topographic and Forest Service maps can be obtained from the Natural Resources Map & Bookstore, 1594 W. North Temple, Salt Lake City, UT, (801) 537-3320 (or 1-800-UTAH-MAP). Remember to bring plenty of water and a first aid kit in case of emergencies. 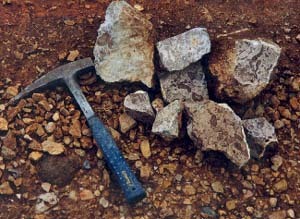 The usual rockhounding tools are needed: gloves, hammer, wrapping paper, and safety glasses. Most importantly, be patient and have fun!